This article is about the geographical feature. For other uses of lagoon, see Lagoon (disambiguation). Balos coastal lagoon of northwestern Crete. The shallow lagoon is separated from the Mediterranean sea by narrow shoals connecting to a small, rocky mountain. A lagoon is a shallow body of water separated from a larger body of water by barrier islands or reefs. Lagoons are commonly divided into coastal lagoons and atoll lagoons. They have also been identified as occurring on mixed-sand and gravel coastlines. There is an overlap between bodies of water classified as coastal lagoons and bodies of water classified as estuaries. Lagoons are common coastal features around many parts of the world. Lagoons are shallow, often elongated bodies of water separated from a larger body of water by a shallow or exposed shoal, coral reef, or similar feature. Some authorities include fresh water bodies in the definition of "lagoon", while others explicitly restrict "lagoon" to bodies of water with some degree of salinity. The distinction between "lagoon" and "estuary" also varies between authorities. Richard A. Davis Jr. restricts "lagoon" to bodies of water with little or no fresh water inflow, and little or no tidal flow, and calls any bay that receives a regular flow of fresh water an "estuary". Davis does state that the terms "lagoon" and "estuary" are "often loosely applied, even in scientific literature." Timothy M. Kusky characterizes lagoons as normally being elongated parallel to the coast, while estuaries are usually drowned river valleys, elongated perpendicular to the coast. When used within the context of a distinctive portion of coral reef ecosystems, the term "lagoon" is synonymous with the term "back reef" or "backreef", which is more commonly used by coral reef scientists to refer to the same area. Coastal lagoons are classified as inland bodies of water. Many lagoons do not include "lagoon" in their common names. Albemarle and Pamlico sounds in North Carolina, Great South Bay between Long Island and the barrier beaches of Fire Island in New York, Isle of Wight Bay, which separates Ocean City, Maryland from the rest of Worcester County, Maryland, Banana River in Florida, Lake Illawarra in New South Wales, Montrose Basin in Scotland, and Broad Water in Wales have all been classified as lagoons, despite their names. In England, The Fleet at Chesil Beach has also been described as a lagoon. In Latin America, the term laguna in Spanish, which lagoon translates to, may be used for a small fresh water lake in a similar way a creek is considered a small river. However, sometimes it is popularly used to describe a full-sized lake, such as Laguna Catemaco in Mexico, which is actually the third largest lake by area in the country. The brackish water lagoon may be thus explicitly identified as a "coastal lagoon" (laguna costera). In Portuguese the same usage is found: lagoa may be a body of shallow sea water, or a small freshwater lake not linked to the sea. Lagoon is derived from the Italian laguna, which refers to the waters around Venice, the Lagoon of Venice. Laguna is attested in English by at least 1612, and had been Anglicized to "lagune" by 1673. 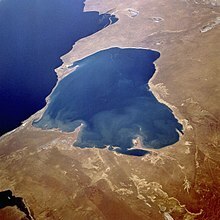 In 1697 William Dampier referred to a "Lagune or Lake of Salt water" on the coast of Mexico. Captain James Cook described an island "of Oval form with a Lagoon in the middle" in 1769. Atoll lagoons form as coral reefs grow upwards while the islands that the reefs surround subside, until eventually only the reefs remain above sea level. Unlike the lagoons that form shoreward of fringing reefs, atoll lagoons often contain some deep (>20m) portions. Coastal lagoon landscapes around the island of Hiddensee near Stralsund, Germany. Many similar coastal lagoons can be found around the Western Pomerania Lagoon Area National Park. 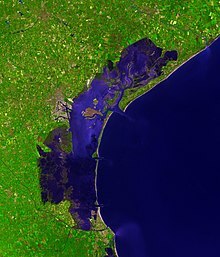 Coastal lagoons form along gently sloping coasts where barrier islands or reefs can develop off-shore, and the sea-level is rising relative to the land along the shore (either because of an intrinsic rise in sea-level, or subsidence of the land along the coast). Coastal lagoons do not form along steep or rocky coasts, or if the range of tides is more than 4 metres (13 ft). Due to the gentle slope of the coast, coastal lagoons are shallow. They are sensitive to changes in sea level due to global warming. A relative drop in sea level may leave a lagoon largely dry, while a rise in sea level may let the sea breach or destroy barrier islands, and leave reefs too deep under water to protect the lagoon. Coastal lagoons are young and dynamic, and may be short-lived in geological terms. Coastal lagoons are common, occurring along nearly 15 percent of the world's shorelines. In the United States, lagoons are found along more than 75 percent of the Eastern and Gulf coasts. Coastal lagoons are usually connected to the open ocean by inlets between barrier islands. The number and size of the inlets, precipitation, evaporation, and inflow of fresh water all affect the nature of the lagoon. Lagoons with little or no interchange with the open ocean, little or no inflow of fresh water, and high evaporation rates, such as Lake St. Lucia, in South Africa, may become highly saline. Lagoons with no connection to the open ocean and significant inflow of fresh water, such as the Lake Worth Lagoon in Florida in the middle of the 19th century, may be entirely fresh. On the other hand, lagoons with many wide inlets, such as the Wadden Sea, have strong tidal currents and mixing. Coastal lagoons tend to accumulate sediments from inflowing rivers, from runoff from the shores of the lagoon, and from sediment carried into the lagoon through inlets by the tide. Large quantities of sediment may be occasionally be deposited in a lagoon when storm waves overwash barrier islands. Mangroves and marsh plants can facilitate the accumulation of sediment in a lagoon. Benthic organisms may stabilize or destabilize sediments. Two similar freshwater lagoons close to the Salar de Atacama. River-mouth lagoons on mixed sand and gravel (MSG) beaches form at the river-coast interface where a typically braided, although sometimes meandering, river interacts with a coastal environment that is significantly affected by longshore drift. The lagoons which form on the MSG coastlines are common on the east coast of the South Island of New Zealand and have long been referred to as hapua by the Māori. This classification differentiates hapua from similar lagoons located on the New Zealand coast termed waituna. Hapua are often located on paraglacial coastal areas where there is a low level of coastal development and minimal population density. Hapua form as the river carves out an elongated coast-parallel area, blocked from the sea by a MSG barrier which constantly alters its shape and volume due to longshore drift. Longshore drift continually extends the barrier behind which the hapua forms by transporting sediment along the coast. Hapua are defined as a narrow shore-parallel extensions of the coastal riverbed. They discharge the majority of stored water to the ocean via an ephemeral and highly mobile drainage channel or outlet. The remainder percolates through the MSG barrier due to its high levels of permeability. Hapua systems are driven by a wide range of dynamic processes that are generally classified as fluvial or marine; changes in the balance between these processes as well as the antecedent barrier conditions can cause shifts in the morphology of the hapua, in particular the barrier. New Zealand examples include the Rakaia, Ashburton and Hurunui river-mouths. Hapua have been identified as establishing in the Canterbury Bight coastal region on the east coast of the South Island. They are often found in areas of coarse-grained sediment where contributing rivers have moderately steep bed gradients. MSG beaches in the Canterbury Bight region contain a wide range of sediment sizes from sand to boulders and are exposed to the high energy waves that make up an east coast swell environment. MSG beaches are reflective rather than dissipative energy zones due to their morphological characteristics. They have a steep foreshore which is known as the ‘engine room’ of the beach profile. In this zone, swash and backwash are dominating processes alongside longshore transport. MSG beaches do not have a surf zone; instead a single line of breakers is visible in all sea conditions. Hapua are associated with MSG beaches as the variation in sediment size allows for the barrier to be permeable. The east coast of the South Island has been identified as being in a period of chronic erosion of approximately 0.5 metres per year. This erosion trend is a result of a number of factors. According to the classification scheme of Zenkovich, the rivers on the east coast can be described as ‘small’; this classification is not related to their flow rate but to the insufficient amount of sediment that they transport to the coast to nourish it. The sediment provided is not adequate to nourish the coast against its typical high energy waves and strong longshore drift. These two processes constantly remove sediment depositing it either offshore or further up drift. As the coastline becomes eroded the hapua have been 'rolling back' by eroding the backshore to move landwards. Hapua or river-mouth lagoons form in micro-tidal environments. A micro-tidal environment is where the tidal range (distance between low tide and high tide) is less than two metres. Tidal currents in a micro-tidal zone are less than those found on meso-tidal (two – four metres) and macro-tidal (greater than four metres) coastlines. Hapua form in this type of tidal environment as the tidal currents are unable to compete with the powerful freshwater flows of the rivers therefore there is no negligible tidal penetration to the lagoon. A fourth element of the environment in which hapua form is the strong longshore drift component. Longshore or littoral drift is the transportation of sediments along the coast at an angle to the shoreline. In the Canterbury Bight coastal area; the dominant swell direction is northwards from the Southern Ocean. Therefore, the principal movement of sediment via longshore drift is north towards Banks Peninsula. Hapua are located in areas dominated by longshore drift; because it aids the formation of the barrier behind which the hapua is sited. A hapua also requires sediment to form the lagoon barrier. Sediment which nourishes the east coast of New Zealand can be sourced from three different areas. Material from the highly erodible Southern Alps is removed via weathering; then carried across the Canterbury Plains by various braided rivers to the east coast beaches. The second source of sediment is the high cliffs which are located in the hinterland of lagoons. These can be eroded during the occurrence of high river flow or sea storm events. Beaches further south provide nourishment to the northern coast via longshore transport. Hapua have a number of characteristics which includes shifts between a variety of morphodynamic states due to changes in the balance between marine and fluvial processes as well as the antecedent barrier conditions. The MSG barrier constantly changes size and shape as a result of the longshore drift. Water stored in the hapua drains to the coast predominately though an outlet; although it can also seep through the barrier depending on the permeability of the material. Changes in the level of the lagoon water do not occur as a result of saltwater or tidal intrusion. Water in a hapua is predominately freshwater originating from the associated river. Hapua are non-estuarine, there is no tidal inflow however the tide does have an effect on the level of water in the lagoon. As the tide reaches its peak, the lagoon water has a much smaller amount of barrier to permeate through so the lagoon level rises. This is related to a physics theory known as hydraulic head. The lagoon level has a similar sinusoidal wave shape as the tide but reaches its peak slightly later. In general, any saltwater intrusion into the hapua will only occur during a storm via wave overtopping or sea spray. Hapua can act as both a source and sink of sediment. The majority of sediment in the hapua is fluvial sourced. During medium to low river flows, coarser sediment generally collects in the hapua; while some of the finer sediment can be transported through the outlet to the coast. During flood events the hapua is 'flushed out' with larger amounts of sediment transferred through the outlet. This sediment can be deposited offshore or downdrift of the hapua replenishing the undernourished beach. If a large amount of material is released to the coast at one time it can be identified as a 'slug'. These can often be visible from aerial photographs. Antecedent barrier conditions combined with changes in the balance between marine and fluvial processes results in shifts between a variety of morphological states in a hapua or river-mouth lagoon on a MSG beach. Marine processes includes the direction of wave approach, wave height and the coincidence of storm waves with high tides. Marine processes tend to dominate the majority of morphodynamic conditions until there is a large enough flood event in the associated river to breach the barrier. The level and frequency of base or flood flows are attributed to fluvial processes. Antecedent barrier conditions are the permeability, volume and height of the barrier as well as the width and presence of previous outlet channels. During low to medium river flows, the outlet from the lagoon to the sea becomes offset in the direction of longshore drift. Outlet efficiency tends to decrease the further away from the main river-mouth the outlet is. A decrease in efficiency can cause the outlet to become choked with sediment and the hapua to close temporarily. The potential for closure varies between different hapua depending on whether marine or fluvial processes are the bigger driver in the event. A high flow event; such as a fresh or flood can breach the barrier directly opposite the main river channel. This causes an immediate decrease in the water level of the hapua; as well as transporting previously deposited sediments into the ocean. Flood events are important for eroding lagoon back shores; this is a behaviour which allows hapua to retreat landward and thus remain coastal landforms even with coastal transgression and sea level rise. During high flow events there is also the possibility for secondary breaches of the barrier or lagoon truncation to occur. Storm events also have the ability to close hapua outlets as waves overtop the barrier depositing sediment and choking the scoured channel. The resultant swift increase in lagoon water level causes a new outlet to be breached rapidly due to the large hydraulic head that forms between the lagoon and sea water levels. Storm breaching is believed to be an important but unpredictable control on the duration of closures at low to moderate river flow levels in smaller hapua. Hapua are extremely important for a number of reasons. They provide a link between the river and sea for migrating fish as well as a corridor for migratory birds. To lose this link via closure of the hapua outlet could result in losing entire generations of specific species as they may need to migrate to the ocean or the river as a vital part of their lifecycle. River-mouth lagoons such as hapua were also used a source for mahinga kai (food gathering) by the Māori people. However, this is no longer the case due to catchment degradation which has resulted in lagoon deterioration. River-mouth lagoons on MSG beaches are not well explained in international literature. The hapua located at the mouth of the Rakaia River stretches approximately three kilometres north from where the river-mouth reaches the coast. The average width of the hapua between 1952 and 2004 was approximately 50 metres; whilst the surface area has stabilised at approximately 600,000 square metres since 1966. The coastal hinterland is composed of erodible cliffs and a low-lying area commonly known as the Rakaia Huts. This area has changed notably since European Settlement; with the drainage of ecologically significant wetlands and development of the small bach community. The Rakaia River begins in the Southern Alps, providing approximately 4.2 Mt per year of sediment to the east coast. It is a braided river with a catchment area of 3105 kilometres squared and a mean flow of 221 cubic metres per second. The mouth of the Rakaia River reaches the coast south of Banks Peninsula. As the river reaches the coast it diverges into two channels; with the main channel flowing to the south of the island. As the hapua is located in the Canterbury Bight it is in a state of constant morphological change due to the prevailing southerly sea swells and resultant northwards longshore drift. Lagoa dos Patos, The largest lagoon in South America, in Brazilian State of Rio Grande do Sul, Brazil. Aerial view of Bora Bora in French Polynesia. Aerial view of Kivalina, Alaska from the northwest. Nearly half the area of Kiritimati is covered with lagoons, some freshwater and some seawater. Nusa Lembongan Lagoon, Bali, Indonesia. Panoramic view of Lefkada City Lagoon, Lefkada Isl., Ionian Islands Prefecture, Greece. Panoramic view of Prokopos Lagoon, Achaia, Western Greece Prefecture, Greece. ^ a b Davis, Richard A., Jr. (1994). The Evolving Coast. New York: Scientific American Library. pp. 101, 107. ISBN 9780716750420. ^ * Allaby, Michael, ed. (1990). Oxford Dictionary of Earth Sciences. Oxford: Oxford University Press. ISBN 978-0-19-921194-4. ^ a b c Kusky, Timothy, ed. (2005). Encyclopedia of Earth Sciences. New York: Facts on File. p. 245. ISBN 0-8160-4973-4. ^ a b c Nybakken, James W., ed. (2003). Interdisciplinary Encyclopedia of Marine Sciences. 2 G-O. Danbury, Connecticut: Grolier Academic Reference. pp. 189–90. ISBN 0-7172-5946-3. ^ Reid, George K. (1961). Ecology of Inland Waters and Estuaries. New York: Van Nostrand Reinhold Company. p. 74. ^ Aronson, R. B. (1993). "Hurricane effects on backreef echinoderms of the Caribbean". Coral Reefs. 12 (3–4): 139–142. doi:10.1007/BF00334473. ^ Maurice L. Schwartz (2005). Encyclopedia of coastal science. Springer. p. 263. ISBN 978-1-4020-1903-6. Retrieved 31 March 2012. ^ Kjerfve, Björn (1994). "Coastal Lagoons". Coastal lagoon processes. Elsevier. pp. 1–3. ISBN 978-0-444-88258-5. ^ Jia, Peng and Ming Li (2012). "Circulation dynamics and salt balance in a lagoonal estuary". Journal of Geophysical Research: Oceans. 117 (C01003). doi:10.1029/2011JC007124. Retrieved 24 March 2012. ^ Goodbred, S., Jr., P. Locicero, V. Bonvento, S. Kolbe, S. Holsinger. "History of the Great South Bay estuary:Evidence of a catastrophic origin". State University of New York. Retrieved 24 March 2012. ^ Boynton, W. R., J. D. Hagy, L. Murray, C. Stokes, W. M Kemp (June 1996). "A Comparative Analysis of Eutrophication Patterns in a Temperate Coastal Lagoon" (PDF). Estuaries. 19 (2B): 408–421. doi:10.2307/1352459. Retrieved 24 March 2012. ^ "Total Maximum Daily Loads for the North and Central Indian River Lagoon and Banana river Lagoon, Florida" (PDF). United States Environmental Protection Agency. Retrieved 24 March 2012. ^ "Proposed Swimming Enclosure Net, Entrance Lagoon, Lake Illawarra" (PDF). Lake Illawarra Authority. Archived from the original (PDF) on 28 February 2011. Retrieved 24 March 2012. ^ Bird, Eric C. F. (2010). Encyclopedia of the World's Coastal Landforms, Volume 1. Dordrecht: Springer. p. 485. ISBN 978-1-4020-8638-0. ^ Oxford English Dictionary. I A-O (Compact ed.). Oxford, England: Oxford University Press. 1971. p. 1560. ^ "The eyes of Atacama". www.eso.org. Retrieved 3 July 2017. ^ a b c d e f g h i j k l Kirk, R.M. and Lauder, G.A (2000). Significant coastal lagoon systems in the South Island, New Zealand: coastal processes and lagoon mouth closure. Department of Conservation. ^ a b Zenkovich, V.P. (1967). "Processes of coastal development". Interscience Publishers. ^ a b c d e f g h i j Hart, D. E. (2009). "River mouth lagoon science and management". Beach management, Principles and Practice. Earthscan Publications Ltd: 267, 280. ^ a b c d e Single, M. (2011). "Lake Coleridge Project-Coastal processes at Rakaia River mouth". ^ a b c d e f g h i Kirk, R.M. (1991). "River-beach interaction on mixed sand and gravel coasts: a geomorphic model for water resource planning". Applied Geography: 267–287. ^ a b Goring, D.G and Valentine, R.M. (1995). "Tidal Hydraulics of a large, gravel-bed river mouth: the Rakaia hapua". ^ a b Hart, D.E. and Bryan, K.R (2008). "New Zealand coastal system boundaries, connections and management". New Zealand Geographer: 129–143. ^ a b Single, M.B. and Hemmingson, M.A. (2001). "Mixed sand and gravel barrier beaches of South Canterbury, New Zealand". Ecology and Geomorphology of Coastal Shinge: 261–276. ^ "McHaffie, N. (n.d.). A GIS based analysis of changes in the Rakaia Hapua, Canterbury." ^ "Hart, D. E. (2009). Morphodynamics of non-estuarine rivermouth lagoons on high-energy coasts. Journal of Coastal Research, SI 56 Proceedings of the 10th International Coastal Symposium."